Cosmology is the study of the Universe as whole and its components. 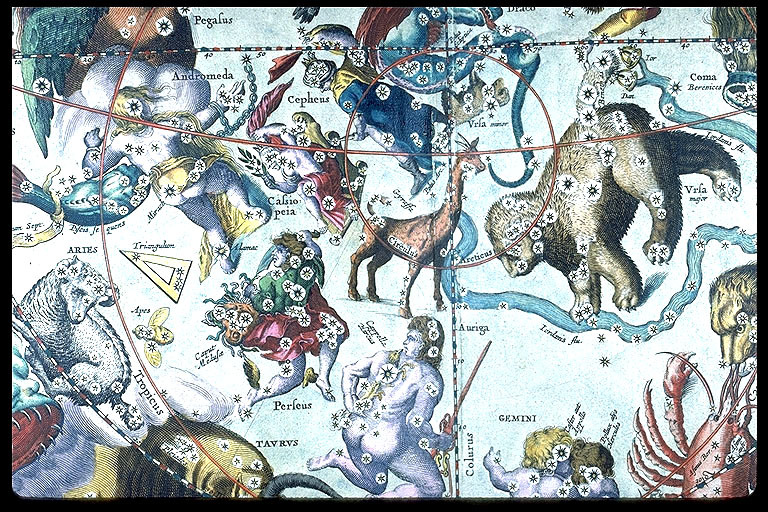 Modern cosmology grew from early ideas before recorded history of "What's going on around me?" into "How does the Universe work?". Many of the earliest recorded observations were about cosmology, and pursuit of understanding has continued for over 5000 years. Cosmology has exploded in the last 10 years with radically new information about the structure, origin and evolution of the Universe, basically the search for the understanding of not only what makes up the Universe (the objects within it) but also its overall architecture. Theories about cosmology operate with a tension between a philosophical urge for simplicity and a wish to include all the Universe's features, which is quite complex. Modern cosmology is on the borderland between science and philosophy, close to philosophy because it asks fundamental questions about the Universe, close to science since it looks for answers in the form of empirical understanding by observation and rational explanation. Very early cosmology, from Neolithic times of 20,000 to 100,000 years ago, was extremely local. The Universe was what you immediately interacted with. Things outside your daily experience appeared supernatural, and so we call this time the age of Magical Cosmology. Later in history, 5,000 to 20,000 years ago, humankind begins to organize themselves and develop what we now call culture. A greater sense of permanence in your daily existences leads to the development of myths, particularly creation myths to explain the origin of the Universe. We call this the age of Mythical Cosmology. The third stage, what makes up the core of modern cosmology grew out of ancient Greek, later Christian, views. The underlying theme here is the use of observation and experimentation to search for simple, universal laws. We call this the age of Geometric Cosmology. Modern cosmology/physics grew out this time and is based on a deterministic reductionism. But, in the last 50 years, cosmology is beginning to take on a more Eastern slant (holism) where the underlying theme is the use of observation and experimentation to search for simple, universal laws. Like any good scientific model, this one offers explanations and various predictions. For example, hot air rises to reach the sphere of Fire, so heated balloons go up. Note that this model also predicts some incorrect things, such as all the planets revolve around the Earth. The Greeks constructed their whole theory of the Universe on the concepts of numbers and shape, arithmetic and geometry. An example of this was when Euclid discovered that there exist only 5 regular solids. 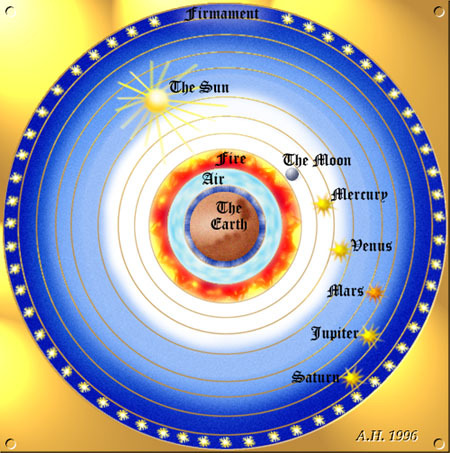 Plato then proposed that these five solids correspond to the four atomic elements in the Universe (earth, water, air and fire) and hypothesized that there existed a five element, called quintessence, which made up the heavenly spheres. Plato, so impressed by the elegance of this discovery, then proposed that four of these solids correspond to the four atomic elements in the Universe (earth, water, air and fire). 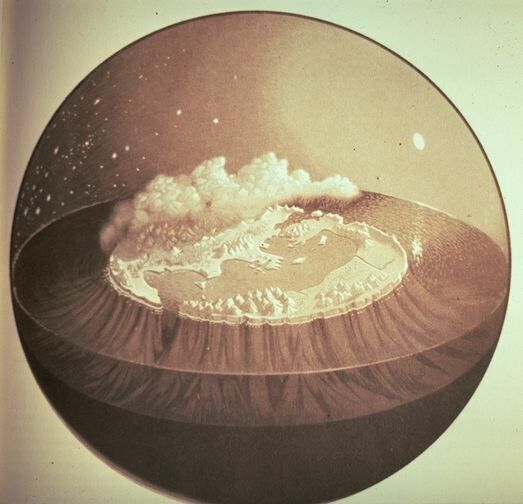 Plate also hypothesized as that the fifth element, quintessence, made up the heavenly spheres. Before the scientific method was fully developed, many cosmological models were drawn from religious or inspirational sources. One such was the following scheme taken from Dante's `The Divine Comedy'. Which is actually a hypersphere. The political and intellectual authority of the medieval church declined with time, leading to the creative anarchy of the Renaissance. This produced a scientific and philosophical revolution including the birth of modern physics. Foremost to this new style of thinking was a strong connection between ideas and facts (the scientific method). Since cosmology involves observations of objects very far away (therefore, very faint) advancement in our understanding of the cosmos has been very slow due to limits in our technology. This has changed dramatically in the last few years with the construction of large telescopes and the launch of space-based observatories. Can science explain everything in the physical Universe? It is a crucial assumption that the Universe is both rational and intelligible. This is often expressed as the principle of sufficient reason, which states that everything in the Universe is as it is for some reason. Causes always precede effects, therefore it is natural to explain the current state of the Universe by appealing to earlier cosmic epochs. Does the chain of cause and effect ever end? Did `something' start the physical Universe and is this `something', the origin of the Universe, within the scope of scientific inquiry? Also note that its easy to imagine a chaotic Universe appearing spontaneously out of nothingness, but how do we understand the present highly complex state of the Universe just popping into existence ready-made? In other words, not only do we need a Universe that is self-creating, it also must be self-organizing. Self-organization may be a deeper mystery then the actual creation event. The debate about the origin of the Universe presupposes that there was an origin. Instead of a beginning, the Universe may be experiencing an endless number of cycles. 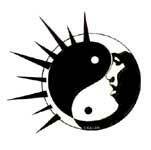 Ancient Chinese believed that all events formed a periodic pattern driven by two basic forces, Yin and Yang. The Hindu cosmological system consisted of cycles within cycles of immense duration (one lifecycle of Brahma is 311 trillion years). Cyclicity cosmologies, and their associated fatalism, is also found in Babylonian, Egyptian and Mayan cultures. 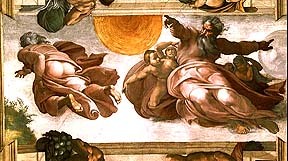 Judeo-Christian tradition was unique in its belief that God created the Universe at some specific moment in the past, and that events form an unfolding unidirectional sequence. Key to this philosophy is that the Creator is entirely separate from and independent of His creation. God brings order to a primordial chaos. Belief that a divine being starts the Universe then `sits back' and watches events unfold, taking no direct part in affairs, is known as deism. Here God is considered a cosmic engineer. In contrast, theism is the belief in a God who is creator of the Universe and who also remains directly involved in the day-to-day running of the world, especially the affairs of human beings. God maintains a personal and guiding role. In both deism and theism, God is regarded as wholly other than, and beyond, the physical Universe. In pantheism, no such separation is made between God and the physical Universe. God is identified with Nature itself: everything is a part of God and God is in everything. A Creation event implies that everything came from nothing (creation ex nihilo) since if there were something before Creation, than an earlier Creation is needed to explain that something. God existed before Creation and, by definition, is not limited to work with pre-existing matter or pre-existing physical laws either. In fact, the most obvious distinction between the Creator and the created Universe is that the Creator is eternal and the created Universe had a beginning. The oldest cosmological paradox concerns the fact that the night sky should not appear dark in a very large (or infinite), ageless Universe. It should glow with the brightness of a stellar surface. Note that the paradox cannot be resolved by assuming that parts of the Universe are filled with absorbing dust or dark matter, because eventually that material would heat up and emit its own light. The resolution of Olber's paradox is found in the combined observation that 1) the speed of light is finite (although a very high velocity) and 2) the Universe has a finite age, i.e. we only see the light from parts of the Universe less than 15 billion light years away.